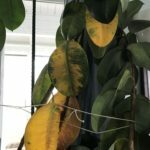 I have a large rubber tree plant that I keep indoors in winter and out in summer. Can I cut branches to make starts and how do I do it? Does it need to be started in soil or water?